My favorite kind of cozy mysteries are those with a paranormal element. There is just something about adding a bit (okay, sometimes a lot) of supernatural to a story that appeals to me most. Despite The Hexed being the thirteenth book in the Krewe Hunters series, it is my first. Fortunately for me, The Hexed is very much a stand alone novel. There is so little (nothing really) about characters that may have appeared in earlier books, that a reader jumping in now should not feel lost or feel like he or she missed out on a minor continuing story line. In The Hexed, readers are introduced to Craig "Rocky" Rockwell, an FBI agent who asks to be assigned to the an elite division of the FBI called the Krewe Hunters. The Krewe Hunters, once a private detection agency, was adopted by the FBI because of their special abilities in dealing with the supernatural, namely ghosts. Rocky is haunted by the ritualistic murder of a friend when they were teenagers and when another body is found in the same area and in the same manner over a decade later, he requests to be involved in the investigation. Devin Lyle, once reporter now children's book author, has only recently returned home to Salem, taking up residence in her deceased aunt's home. One night she hears a cry for help and runs outside into the woods by her house only to find the body of a woman. Devin is pulled into the investigation of the murders due to her ability to see and talk to ghosts, one of which Rocky and Devin are sure has the key who is behind the murders and why someone would want the women dead. Add in an eccentric great-aunt who is a ghost, a black raven named Poe, and a budding love story, and you have an entertaining novel. I really liked the character of Rocky. He is such a sweetheart, maybe a little too perfect. I found it interesting how the Krewe team gave him lead upon their arrival to town to help with the murder investigation, especially given how new he was to the unit. It made sense in some ways, I suppose: this was the area he had grown up in, one of his childhood friend's was the local lead on the case, and he was the first on the scene. It wasn't something that bothered me at all, just something I noticed. Devin was no slouch, that's for sure. She's smart as a whip, especially when it comes to the history of the area. Sometimes when a civilian character gets involved with a police investigation it seems too unbelievable to buy into, but not so in Devin's case. At least I did not think so. In part, keeping her close was to protect her, but she was also the person the ghost from long ago wanted to talk to. I enjoyed seeing the evolution of Devin and Rocky's relationship, but admit the moment they made their feelings known seemed forced somehow and so sudden. It wasn't how I imagined either character acting except maybe in their heads. Still, it was not a bad thing. Given how stressful the situation was, how dangerous, I should not be completely surprised. The Hexed was an enjoyable read. I suspected just about everyone in the book at one point or another of being the killer, but it was not until closer to the end that I had it figured out. Somewhat. The investigation was slow going at times, but rightfully so given the amount of research and foot work the characters had to do. There is a bit of a need to suspend one's disbelief (and I'm not referring to the ghosts) in how Rocky came to some of his conclusions, but it was easy to look past as much fun as I was having reading to see what would happen next. Will I read more by this author? Absolutely. I'm curious to learn more about the other members of the Krewe Hunters team and see what mysteries they encounter. To learn more about Heather Graham, and her books, please visit the author's website. I hope you will check out what others had to say about The Hexed on the TLC Book Tours route! Many thanks to the TLC Book Tours for the opportunity to be a part of this book tour. E-Copy of the book provided by the publisher. I read The Cursed earlier this summer and enjoyed it so I'm glad to know you enjoyed The Hexed. I'm glad that the civilian getting involved in the investigation worked. I can't wait to get started on this one! Katherine - I remember your review of The Cursed. :-) I have that one on my Kindle to read. This sounds like a fun read with well-drawn characters. Sounds like a good book, and series. More substance than just a romance novel. I enjoyed her book, The Last Noel. Carla - The mystery definitely takes precedence, although the romance is a significant side story. This was my first book by the author. I'll have to look for The Last Noel. I like mysteries with a dose of supernatural. This one sounds like a good read. Thanks for the lovely review, Wendy! Great review. I really enjoy the look and sound of this. I also like cosies with a supernatural twist as they tend to be less dark. Tracy - Thank you. This was a nice cozy-definitely on the lighter side, even despite the crime. I've only read one of this series, The Night Is Forever. It was a light read, but entertaining. This one sounds better. Jenclair - While this one wasn't perfect, it was entertaining. I hope to read more in the series eventually. It's great that it wasn't predictable! Great review. Hmm, I get the feeling everyone is anxious for RIP to start! lol This looks like a perfect book for it. I haven't heard of this series either, so onto my reading list it goes. 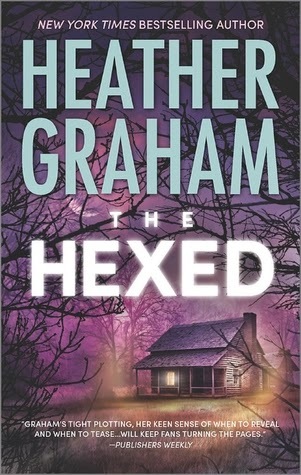 I've read some other Heather Graham books, just not with this series. And hurray, my library has it and there are more copies than holds!!! thanks for reviewing it now, Wendy :-) it will be on my RIP pile! I can hardly wait :-) it sounds a little creepy and scary, which like you I enjoy. Oooh I haven't read one like this for a long time, thanks for sharing your thoughts, another to keep an eye out for! Lainy - I hope you like it if you decide to read it! This one sounds really good - I'm in need of a light read. Carrie - It's definitely that! I hope you'll also enjoy the other books in the series! Thanks for being a part of the tour. Heather - I think I will! I always enjoy Heather Graham's mysteries that have a touch of the supernatural. I wonder why I don't read more of them? Oh, that's right, there aren't enough hours in the day! My reading and blogging has taken a big hit lately. This was my first by her, but it definitely won't be my last!